Antenna Magus version 2.3 released! An update to Antenna Magus, version 2.3, is now available for download. This update features 10 new antennas, as opposed to the usual 6. Extensions have been made that allow Antenna Magus to export models comprising multiple files where needed. This feature enables Antenna Magus to export models that use impressed excitations defined in secondary files. There have been a number of antenna models that have been withheld, pending the availability of this functionality - hence the larger than usual update. This newsletter will give a quick summary on the additional 10 antennas in the database and will also focus on the various reflector antennas that have been made available since the release of Version 1.0. Image of the Potter horn antenna. 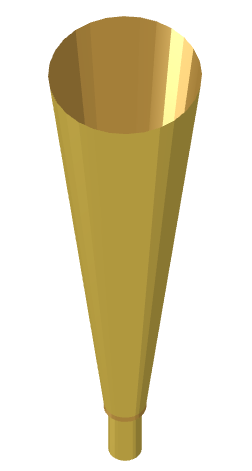 The Potter horn (not to be confused with the vuvuzela used in the recent FIFA world cup in South Afrca) was first suggested by P. D. Potter in 1963 and is very popular in applications where a radiation pattern with suppressed sidelobes and equal E- and H-beamwidths are required with minimal complexity of manufacture. 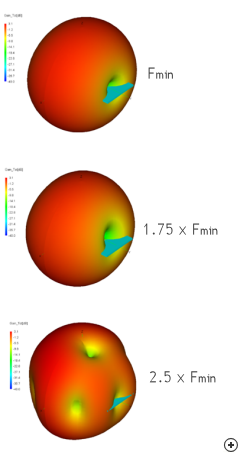 As with the Corrugated conical horn, the Potter horn achieves complete beamwidth equalization in all planes, complete phase centre coincidence, and at least 30 dB sidelobe suppression in the electric plane over a narrow operating band; using a technique referred to as dual-mode excitation. This is achieved without the need of an OMT (orthogonal mode transducer) feed or corrugations in the structure. Although the Potter horn is longer than the corrugated horn, it has smooth walls and is much simpler to manufacture, particularly for higher frequency applications. 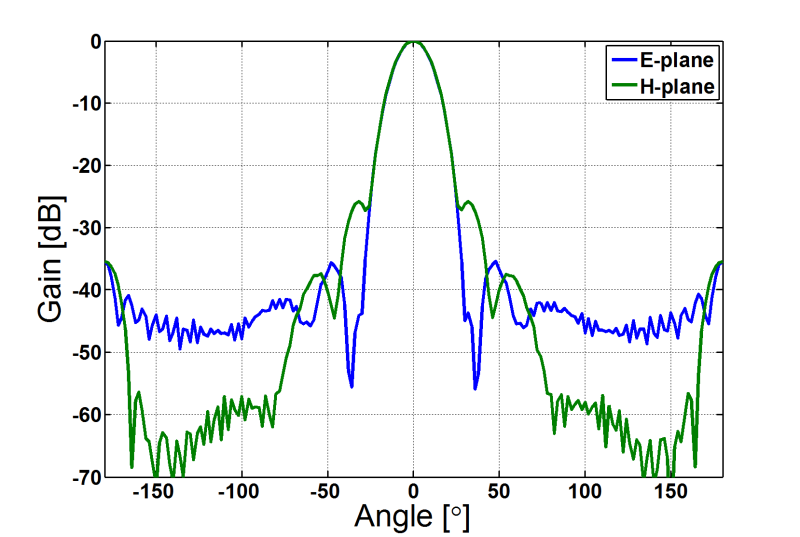 The following image shows typical normalized E- and H- plane patterns of a Potter horn, illustrating the beamwidth symmetry. Typical normalized E and H plan patterns of the Pottern horn having identical main lobes. 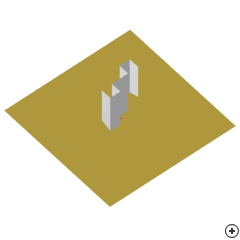 Image of the Circularly polarised rectangular Bi-Quad. The Circularly polarised rectangular-Biquad antenna is similar to the standard bi-quad antenna in terms of size and performance. 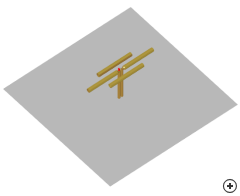 The feed of the Circularly polarised rectangular-Biquad antenna differs from the classical Biquad feed, in that the two arms are driven against each other (in the same way that a dipole or bowtie would be fed). This antenna is very simple to construct and performs well over a moderate frequency band with up to 10 dBi gain. Image of the Planar sleeve monopole with transparency. This antenna is very popular in wireless network (WLAN) and other communication systems as it can be integrated as part of the circuitry. There are various types of planar monopoles (like the shorted planar monopole, modified inverted-L monopole and compact monopole etc)- the Planar sleeve monopole discussed here is one variation of the planar monopole class. This monopole operates over a relatively wide bandwidth of up to 2.5:1 radiating an isotropic pattern having approximately 2 dBi gain. 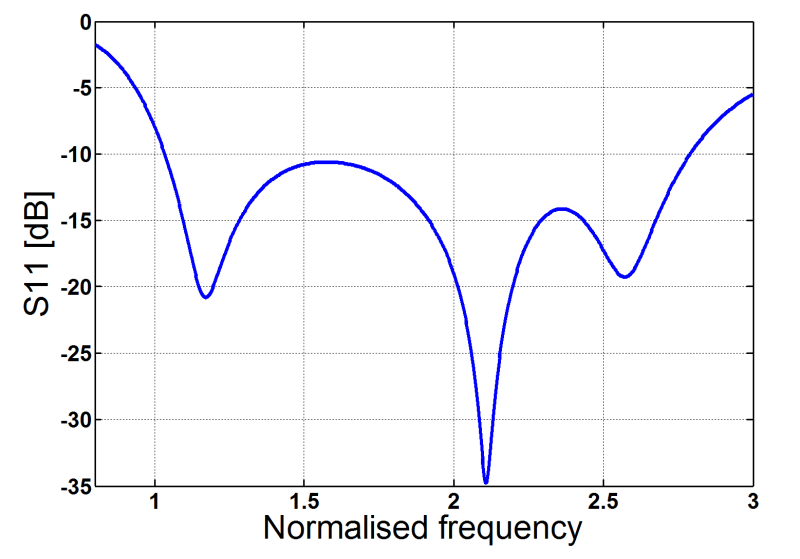 The first graph below shows s11 designed at fc = 2.4 GHz and the second graph shows three typical 3D farfield patterns across the operational band. 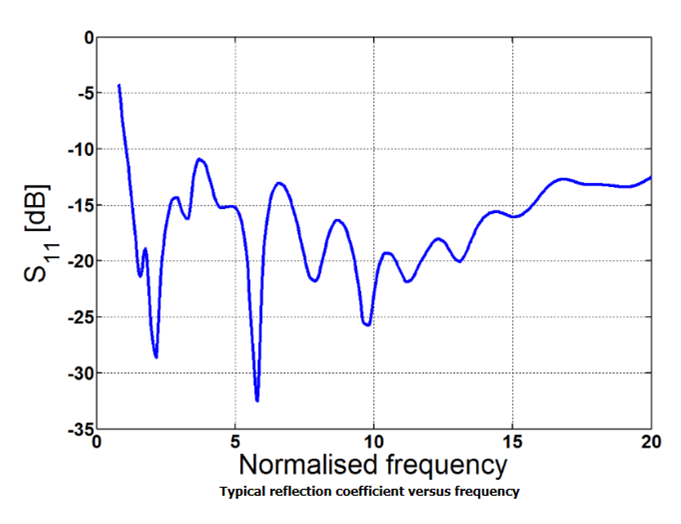 Normalised relfection coefficient of the Planar sleeve monpole antenna. Image of the Ultra wideband (UWB) accordion monopole antenna. High data speeds and multiband operations of modern wireless communication systems have significantly increased the demand for simple, but very broadband antennas. 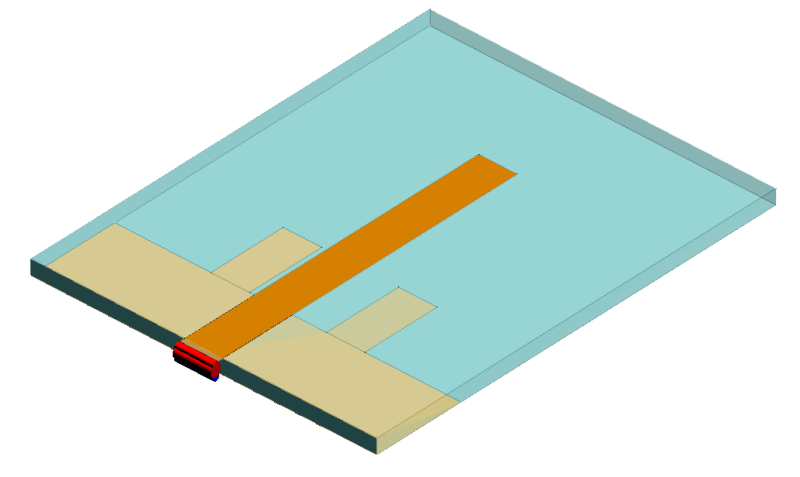 In general, the systems need low-cost solutions with application-specific requirements in terms of impedance bandwidth, polarisation and gain. Planar monopole and dipole antennas are often good options here - though they usually have a high profile above the ground-plane. The UWB accordion monopole achieves a much wider impedance bandwidth than most other planar monopoles, including popular structures like the Circular disc monopole and the Rectangular monopole with a semicircular base. While an impedance bandwidth of up to 38:1 is reported (see graph image below), the uniformity of the azimuthal pattern is only retained for a 3.4:1 bandwidth as shown in pattern comparisons in the second image below. The exceptionally wideband operation of this structure also makes it a good candidate for ultra wideband pulse applications. 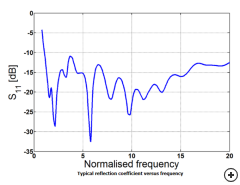 Typical normalised reflection coeefficient of the UWB accordian monopole. Typical 3D Radiation patterns vs frequency. 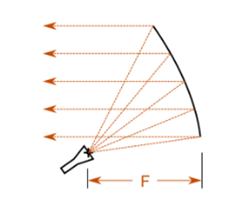 Image of the Offset (symmetric) parabolic reflector. A variation on the basic Axisymmetrical parabolic reflector fed by an on-axis horn antenna is the Offset horn-fed parabolic reflector. One main advantage of offsetting the feed is that it eliminates aperture blockage caused by the feed horn and the mounting struts when using an on-axis feed. The version of this topology included in Antenna Magus is a Symmetric offset parabolic reflector fed by a pyramidal horn antenna - although a variety of other feed antennas may be used, including simple conical horns, corrugated conical horns, axial-choke horns and coaxial-choke horns, to name a few. 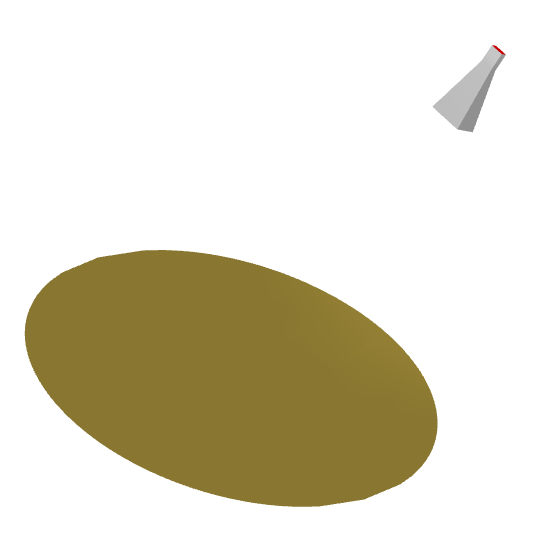 Ray collimation of the offset parabolic reflector antenna. Positioning the feed is more complex when compared with the on-axis fed reflector antenna, as the feed horn has to be carefully placed so the phase center coincides with the reflector's phase center. In addition to reducing aperture blockage losses sidelobes caused by diffraction and cross-polarisation effects are reduced by offset feeding. The asymmetry of the offset reflector, however, introduces other anomalies and asymmetries in the radiation pattern. 'Vertical' symmetry prevents cross-polarisation in that plane while cross-polarisation is increased in the 'horizontal' plane. 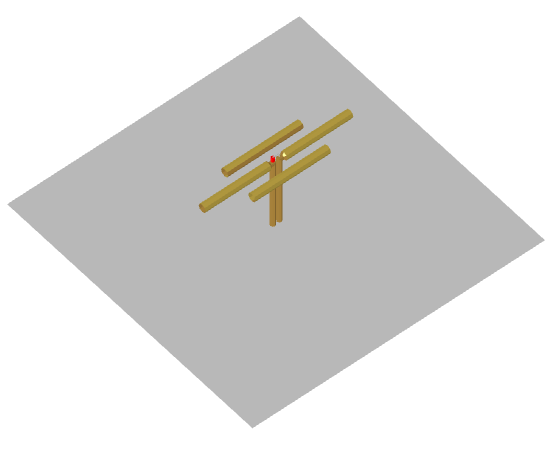 Also included in Antenna Magus 2.3 is a complimentary pattern fed version of this antenna which is very useful for quick simulations where coupling between the reflector and feed can be ignored. 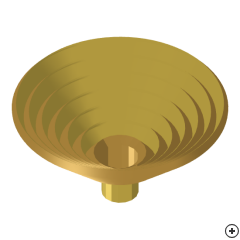 Image of the Waveguide-fed scalar corrugated conical horn. When compared to the Standard corrugated conical and Axial choke corrugated horns (already in Antenna Magus), the Scalar corrugated conical horn has a lot of similarities, a few advantages and a few disadvantages. 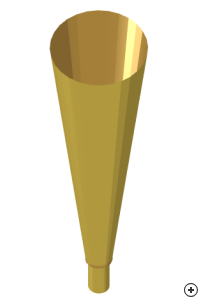 Cross-sectional view of three different corrugated horn antennas. The above image shows cross-sectional views of three corrugated horn types available in Antenna Magus. Note that the Scalar horn's corrugations are normal to the flare. This makes it much harder to manufacture when compared to the standard Corrugated horn and Axial choke which have corrugations normal and parallel to the main axis of the horn respectively. The Scalar horn is slightly wider band - up to 2:1 bandwidth compared to 1.5:1 of the standard Corrugated horn. 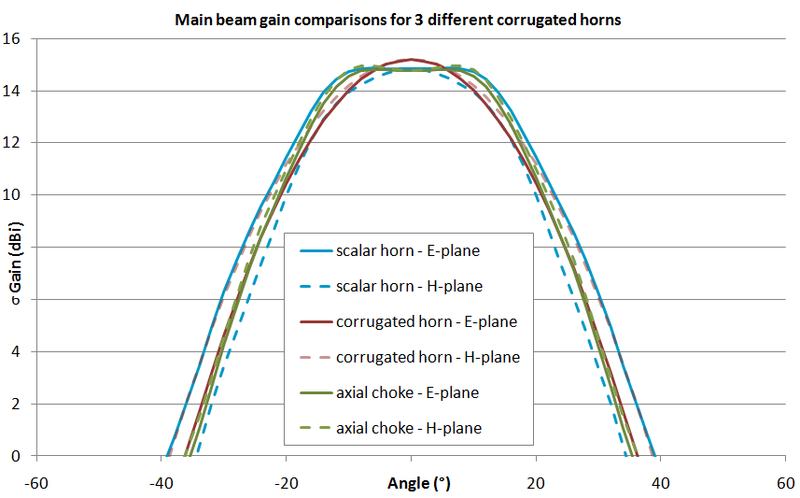 In Antenna Magus, both the Scalar- and Axial choke corrugated horns can be designed for maximum main beam flatness. 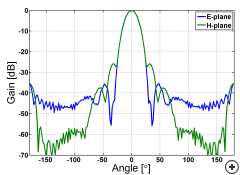 The graph below compares the gain vs angle for all three antennas designed at 10 GHz for 15 dBi gain. Both the Scalar- and Axial choke horns have similar physical dimensions (approximately 185 x 185 x 125 mm3) with 9 and 20 corrugations respectively where the standard Corrugated horn is almost half the size (approx. 74 x 74 x 84 mm3 ) with only 6 corrugations. Note that although the standard Corrugated horn is more compact with fewer corrugations it has lower main beam efficiency compared to its larger counterparts. Main beam gain comparisons for three different corrugated horn antennas. Image of the Open sleeve dipole. The half-wave dipole antenna forms the basis for a number of other antennas such as the linear- and planar dipole arrays as well as Yagi-Uda and LPDA arrays. 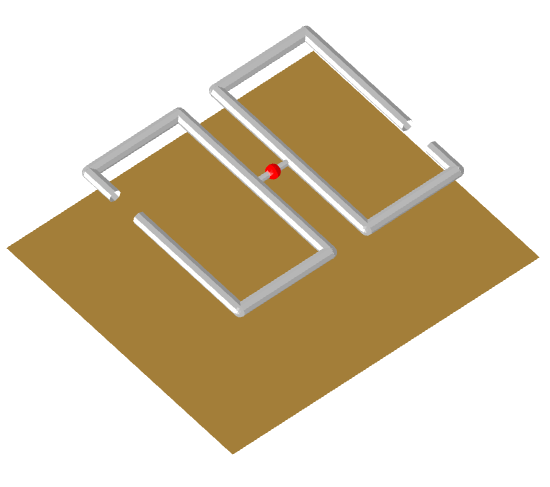 In its simplest form, it consists of two co-linear quarter-wavelength wire sections driven in anti-phase with respect to one another. 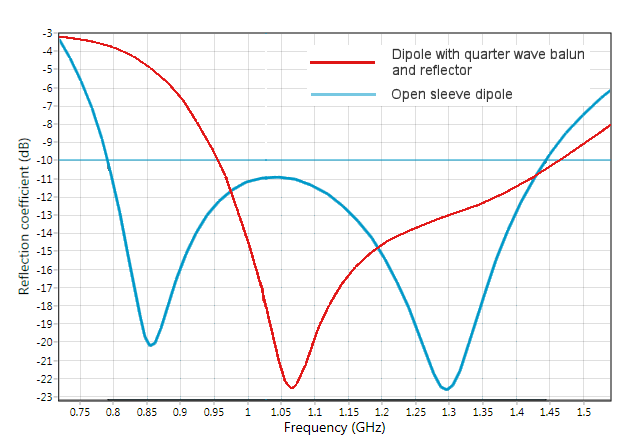 One popular way of increasing the operating bandwidth of a dipole structure is by using a sleeve. There are various ways in which a sleeve can be added to a dipole structure. The Open sleeve dipole is one very practical way to do this. The Open sleeve dipole mentioned here includes a reflector and a quarter-wave balun, to enable feeding of the structure using an unbalanced coaxial line. 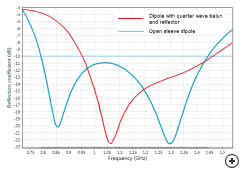 Furthermore, two parasitic elements (sleeves) are added which enables a much wider bandwidth of typically 70% compared with 30% for a Cylindrical dipole with a quarter-wave balun in front of a reflector. 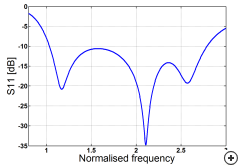 The image below shows a comparison between the S11 of the Open sleeve and the Standard quarter wave dipole with quarter-wave balun designed and simulated in Antenna Magus. S11 comparison between the Dipole with quarter-wave balun and reflector antenna vs the Open sleeve dipole antenna. A selection of reflector antennas in Antenna Magus. 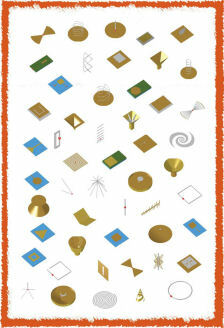 Antenna Magus has grown over the past 18 months to include a wide variety of reflector antennas. The image above is a compilation of the reflector antennas in the current database. Version 2.3 introduces 5 "new" reflector antennas as indicated. 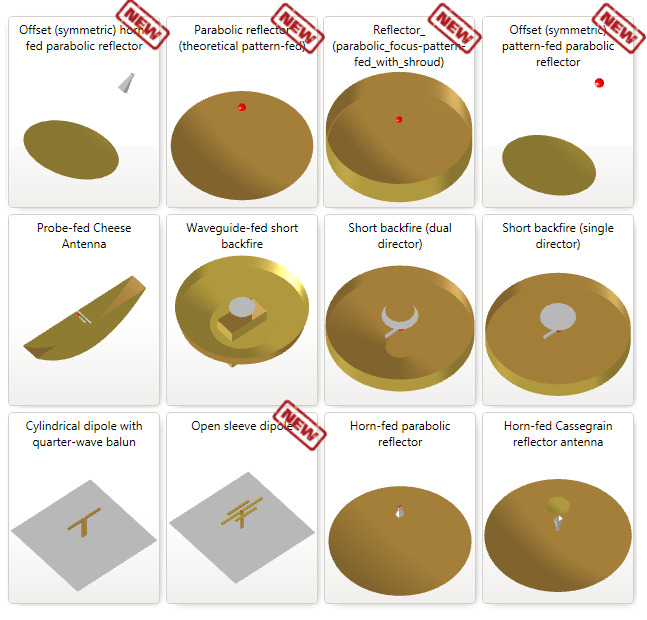 Three of the latest antennas that were added are "pattern fed" variants of existing antennas, namely the Parabolic pattern-fed reflector, parabolic reflector with shroud and the Offset (symmetric) pattern fed parabolic reflector. 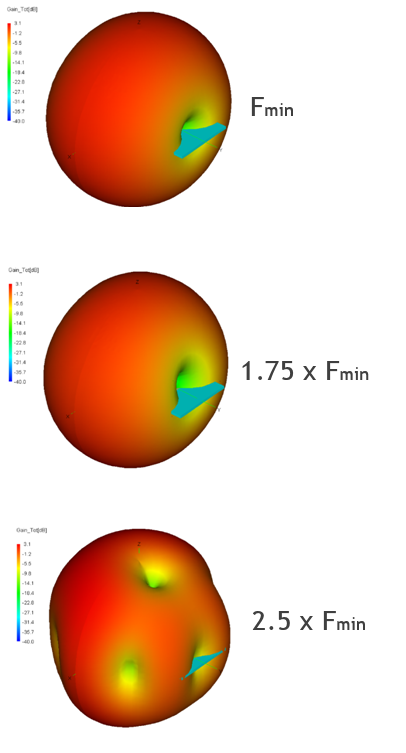 The pattern-fed reflector feed element consists of a pre-calculated Cosine-Q pattern that is impressed as a farfield point source to excite the reflector structure - resulting in a very efficient simulation approach.. 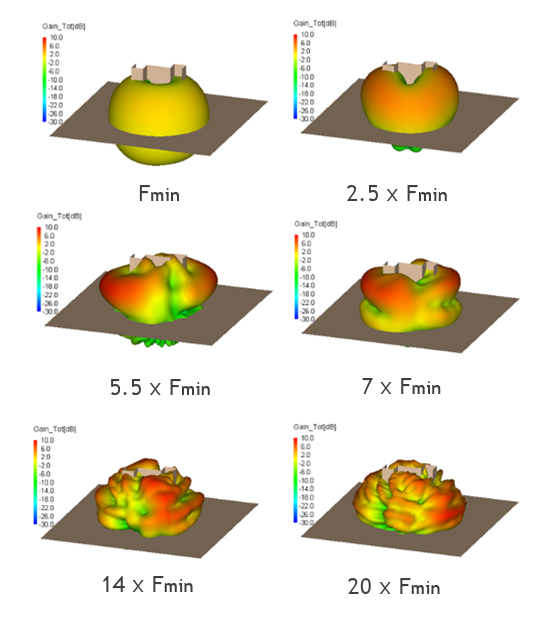 In order to simulate antennas in this way, multiple files are required (one file containing the information of the precalculated radiation pattern and another containing the reflector model). Antenna Magus exports both these files as inside a zip-archive making them easy to transport and manage. . 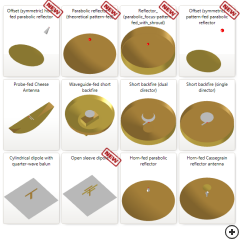 These reduced order models are useful for initial design analysis, parametric studies, placement studies, or other situations where the accuracy of the feed interaction and aperture blockage are not of primary concern. Are there antennas that you are interested in, but cannot find in Antenna Magus? Our development backlog is influenced by the requests we get from users, so please let us know! Please send your requests to your reseller, or email support@antennamagus.com - and remember that the more detail that you can provide about the antenna, the greater the chance we will be able to add exactly what you are looking for!